Duke is one of only two top-ten universities to offer merit scholarships. … Though some critics of merit aid programs say the scholarships can take resources away from students who need financial help most, University administrators say this is not the case for Duke. The University maintains eight merit scholarship programs while also growing the amount that is given to students with financial need, according to Melissa Maouf, director of the Office of Undergraduate Scholars & Fellows. “Our merit communities are a mixed bag, economically all over the place,” Malouf, wrote in an email Wednesday. “All students to apply to Duke may be considered for a merit scholarship—rich or poor or in between. Only three Duke scholarships are solely merit-based. Three of the eight scholarship programs Duke offers—the Angier B. Duke Scholarship, the Benjamin N. Duke Scholarship and the Robertson Scholarship—solely take merit into account. The remaining five scholarship programs consider a mixture of merit and need. Nearly 4% of Duke students receive merit aid. In 2013, Duke provided merit scholarships averaging about $56,000 per year to 314 students, nearly 4 percent of the undergraduate body, according to the 2013-14 CDS survey. Only one other top-ten school, the University of Chicago, also offers merit awards. All the other schools only give need-based financial aid. Jenna Zhang, “Duke stands alone among peers in merit-based scholarship priorities”, The Chronicle, January 20, 2015. For high school seniors, it can be comforting to be able to secure admission to a good school early on in application season. It reduces the stress during the months of applying and waiting for decisions from other colleges. For this reason, high-achieving students should consider applying to “High-Ranking Schools With Rolling Admissions”. Rolling admissions are often offered by large state universities. Students can apply in the fall, sometimes as early as September, and receive word within a few weeks. Delece Smith-Barrow, “High-Ranking Schools With Rolling Admissions”, U.S. News & World Report, Nov. 6, 2014. It’s been a few years since I wrote about low-cost out-of-state schools, so it’s a good time to revisit this topic. What type of students are typically interested in affordable out-of-state public schools? Residents of states that lack good options for affordable public colleges. Students who want to experience living in another part of the country during their college years. Lynn O’Shaughnessy recommends avoiding most “name brand” * state flagships, which usually expect out-of-state students to pay full price. Instead, look at other less well-known options. The New York state universities (SUNY’s) , for instance, represent some excellent values. Unlike many states, New York state has continued to support its public universities at levels other state legislatures have long abandoned. Another potential great buy is the University of Minnesota in Minneapolis, which is a bargain compared to Michigan. I once asked a teenager why he thought that the University of Michigan is so much more popular than the U. of Minnesota, which is located in the Twin Cities. “Minnesota is cold,” he replied. I mentioned that Michigan is hardly a temperate climate. My theory is that Michigan has enjoyed a long and storied tradition of success in the Big 10 athletic conference and the Minnesota Gophers have not. The University of New Mexico has impressive scholarships even for students with a 3.0 GPA and it’s located in a city (Albuquerque.) I am hoping that a daughter of a family friend, who is a gifted dancer, ends up at the University of Utah’s modern dance program, which is considered as good, if not better, than Julliard’s.The scholarships for nonresidents can be more generous and prices much lower to begin with at schools that have to work harder to attract nonresidents. University of Arkansas, for instance, has tons of scholarships for nonresidents. A huge plus at Arkansas is the tremendous amount of internships for students because of Walmart’s proximity. Walmart requires major corporations to maintain an office in Arkansas so there are hundreds of corporate outposts in the state. Kiplinger’s most recent Rankings of Top Public College Values shows 54 schools with total annual costs under $35,000. A California resident facing annual costs ranging from about $23,000 to $35,000 for in-state schools may look to an option like Arizona State University where OOS costs are about $36,000 per year. Add in the challenges of admission and course availability that persist in some schools in the California system, and the idea of tacking on an extra $35,000 or so in costs over four years by going out of state may seem like a fair deal. U.S. News offers a list of low-cost schools that may come out to be a better value than in-state choices. Some regional colleges and universities are so cheap, even for out-of-staters, that they give Home State University a run for its money…. Most of these public institutions are regional colleges and universities in Midwestern or Western states​ that may not entice many 18-year-olds the way, say, New York or California do. But a Pennsylvanian student eyeing the in-state price tags of Pennsylvania State University or the University of Pittsburgh, both topping $17,000 a year, might start to find them more appealing. VERY LOW COST OOS COA universities……less than $25k COA for everything! Lynn O’Shaughnessy, “Would You Pay $47,000 for the University of Oregon?”, The College Solution, April 20, 2015. Susannah Snider, “Public Colleges With the Cheapest Out-of-State Tuition and Fees”, U.S. News & World Report, September 30, 2014. Among its “tips for deciphering financial-aid letters”, the Wall Street Journal includes information that can be useful in evaluating student loan offers. The federal government pays interest charges on federally subsidized loans while a student is in school, for example, which can help borrowers substantially. Such loans are generally given to students who demonstrate some kind of financial need, but students don’t need to come from low-income families to qualify. Just over 34% of undergraduates with family income of at least $100,000 received subsidized Stafford loans at colleges where total annual costs, including tuition and room and board, were at least $30,000 in 2011-12, according to an analysis by Edvisors of the most recent federal data available. Just 12% of such students received the loans when attending less-expensive colleges. Unsubsidized federal loans can be less desirable because interest accrues while the student is in school, which—if unpaid—could result in a significantly larger balance by the time the student graduates. Some colleges don’t include unsubsidized loans in financial-aid offers. Colleges and universities also may offer their own loans, which may or not be preferable. Compare and contrast the terms on offer, including the interest rate and when interest charges begin to boost the outstanding balance. Annamaria Andriotis, “How to Play the College Financial-Aid Game”, Wall Street Journal, April 17, 2015. Don’t wait until your child’s senior year of high school to begin planning how to pay for college. The first 18 years go quickly, and it’s never too soon to begin preparing. 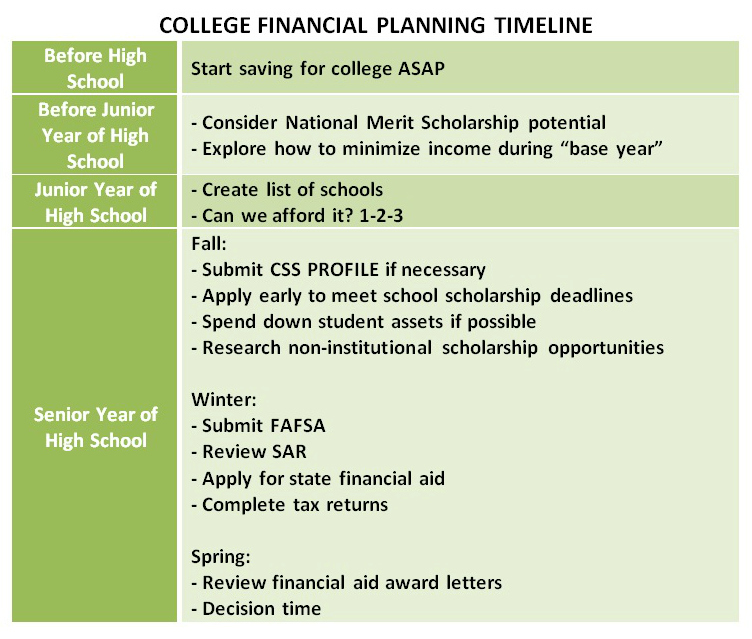 Here’s one simplified approach showing some important steps along the timeline to college, with a focus on the financial planning aspect of the process. Start saving for college ASAP: This is the relatively uncomplicated part. Although we can’t predict the costs of college over a child’s lifetime, it almost always makes sense to begin saving early on. Even if MOOCs or other innovations make higher education more affordable in the future, there’s usually not much of a risk in saving too much since there are options for dealing with “left-over money in your 529 plan”. NMS potential: If your child tends to score in the 95%ile of standardized tests, he may have a shot at earning a National Merit Scholarship. A little test prep can make the difference in qualifying for significant merit financial aid. Base Income Year (BIY): If there is a chance your family may qualify for need-based financial aid, you should explore ways to minimize income during the BIY, the 12-month period that begins January 1 during your child’s junior year. Since the BIY is used as a snapshot for determining financial need, you may want to consider strategies such as not selling stocks or property that will create large capital gains, refrain from converting to a Roth IRA, or defer bonus or other income. Create list of schools: Get serious and make a realistic list that includes academic and financial safeties. Can we afford it? 1-2-3: Determine affordability by using the 1-2-3 Method or something similar. The two main forms used in determining financial aid eligibility are the FAFSA and PROFILE. FAFSA is the acronym for Free Application for Federal Financial Aid. It is a form submitted to the government that collects the financial information needed to decide your eligibility for federal FA. It’s also used by many colleges to determine institutional aid. PROFILE is a financial aid application service offered by the College Board, used by about 400 colleges to learn if students qualify for non-federal student aid. There is a fee to submit a PROFILE, whereby the FAFSA is free. The SAR (Student Aid Report) is a summary of your FAFSA responses and provides “some basic information about your eligibility for federal student aid”. It’s important to get started. While this outline only hits the highlights along the road to paying for college, it can be used as a springboard for further research and action. It makes sense to start with an outline, and then fill in the details as you go along. A growing number of employers say a degree from a prestigious college counts less than it once did. But among elite finance and management-consulting firms—which offer some of the highest starting salaries for new graduates—an alma mater still matters. That puts students from less-selective schools at a disadvantage, career-services officers and students say. A tale of two students demonstrates how the path to prestigious Wall Street jobs is easier when the starting point is an Ivy League school. To land a summer job on Wall Street this year, Fairfield University junior Matthew Edgar sent 300 emails, made dozens of phone calls and several networking trips to New York banks from the Connecticut campus. Darwin Li had a more direct route: The Princeton University junior applied online for positions and attended campus information sessions where company recruiters walked him through the application process and the firm’s culture. The preferred schools vary depending on different career paths, but for Wall Street “they tend to include Ivy League schools and a handful of other elite institutions, such as Stanford University”. Other careers have their own list of preferred schools, so the message to students with specific job goals is to do your research. Students who do not attend preferred schools are not shut out completely, but they have to work harder. For students at nontarget schools, the trick is finding a way into that pool. Without recruiters on campus, they must initiate a blitz of emails, calls and messages through networking sites like LinkedIn to find a banker or consultant willing to flag their application to recruiters. Related: If you want a job at an elite firm . . .
Lindsay Gellman, “How 300 Emails Led to a Summer Job on Wall Street”, Wall Street Journal, April 1, 2015. Stanford University just got more affordable for upper middle-income families. Stanford University announced last week that tuition will be free for students whose families earn less than $125,000 a year. The standard had been $100,000. Students whose families’ annual incomes are lower than $65,000 will also be exempt from paying room and board, up from the current $60,000 cutoff. Wealthy students help pay for the free ride received by other students. … Stanford is able to fully subsidize the tuition of these students because of the high number of wealthy students who attend…. Cost of attendance at Stanford before financial aid is “roughly $65,000” per year. Of course, before getting the great tuition deal, students will have to gain admission at the “Toughest College to Get Into in the United States”. … Stanford University is the toughest college to get into in the nation. Yes, harder to get into than Harvard. Fred Imbert, “Stanford just made tuition free for these students”, CNBC, April 2, 2015. Liz Dwyer, “What’s the Toughest College to Get Into in the United States? Hint: Not Harvard”, TakePart, April 01, 2015. Is your college at risk for closing? The closing of Sweet Briar College caught many students and potential students by surprise, disrupting their plans and creating uncertainties in carefully laid-out plans of how to pay for college. No one wants to be in that situation, and the Washington Post offers tips on “How To Spot A College About To Go Out Of Business”. Applicants should try to know as much as possible about the financial strength of the schools they are considering. One-third of all colleges and universities in the United States face a financial future that is significantly weaker than before the 2008 recession and are on an unsustainable fiscal path, according to an analysis published in 2012 by Bain & Company. Another quarter of colleges find themselves at serious risk of joining them. Smaller colleges are at higher risk for closing. Even if a college is not forced to close its doors, financial stress can affect students if it means staff cuts, limiting course options, inadequate building maintenance, and more. So it’s a good idea to include financial strength to the components to consider when selecting a college list. Jeffrey J. Selingo, “How to spot a college about to go out of business”, Washington Post, March 11, 2015. Posted in college search and selection | Comments Off on Is your college at risk for closing? One of the most basic questions during the college planning process is often one of the hardest for a family to answer. Can we afford this college? The hard part is usually not in knowing what you can afford to pay, but in trying to find what the net cost of attendance will be for your child. Here’s a three-step process that may help you answer this question. The NPC is an online tool that is a useful first step in comparing affordability. Every college website has a calculator, which typically requires entering family financial information such as income and assets before the estimated net price of attending is generated. Remember, this is an estimate and may not produce accurate results for business owners and other situations. Proceed with caution, and check for online resources like the CollegeBoard tip sheet to help in the process. A list of 12 questions to get you started on gathering information about a school’s financial aid policies is provided by the CollegeBoard. In my experience, the answers to most of these questions can usually be found on college websites. Going through these questions often prompts families to consider other important questions about college costs. Okay, so not all your answers about costs and financial aid were easily found on the college website or other online resources? Contact the college’s financial aid office and get the information directly from them. They should be able to give you information rather quickly, and if they don’t it might be an indication of how transparent and helpful they are in other situations. For organized families, it’s not a bad idea to create a spreadsheet that can capture important information and allow for efficient comparisons. So you’re interested in a career in hotel and resort management? What is it like to manage a hotel, and what kind of background is needed for this career? Here’s the story of a hotel manager who does not have a college degree, but who worked his way up from his first job as a valet. I’m in my late twenties and I work at a major 150+ room hotel in a major city in Louisiana. My official title is “Operations Manager.” I’ve been working in hotels since 2007, first as a valet and bellman for two years at a 200 room corporately-owned resort in coastal Alabama, then at the front desk at a smaller independent hotel. After that I was a front desk agent at a 300 room corporate hotel in Dallas where I was promoted to front desk manager, and finally I moved to Louisiana a year ago. I started at my current hotel as front desk manager and was promoted to Operations Manager in a couple of months. I’ve been at this hotel for one year. A college degree may be the preferred way to enter this field, but another way is through “a beastly work ethic”. To get my first hotel job I just walked in and applied. It’s easy to get an entry level position. To be an Operations Manager, you usually need a bachelor’s degree in Hospitality Management/Business or, like me, a beastly work ethic, willingness to go above and beyond expectations, work long hours, and volunteer to take on tasks around the hotel that go outside of your job description. A degree can offer specialization in various areas, including travel and tourism. Hospitality management, or hospitality administration, is a large field with an array of majors. Depending on your interest and skills, you can pursue degrees centered on hotel management, travel and tourism, conference or event management, the restaurant industry and more. A course of study can cover everything from business to food science to botany, and internships and assistantships are typical components as well. U.S. News offers information about hospitality management scholarships. An associate’s degree in hospitality management is another way to prepare for a career in this field. The bad news is that competition is tough for the best jobs. Job growth in management positions is projected to show little or no growth over the next several years, even though growth in tourism and travel is predicted to be robust. Like many other segments of the economy, the hospitality industry is streamlining operations, leading to scaled-back staffing. Median salary in 2012 was $46,810. In New York, SUNY at Delhi is a state school that offers a BBA Hospitality Management: Hotel and Resort Management. Their students can participate in the Walt Disney College Program. … Through this program, students work at Walt Disney World in Orlando, Florida, for six months in a unique working/learning experience. Students can now earn SUNY Delhi course credit for the Disney courses offered as part of this program while they are working at Disney. Any student interested in this special program option should discuss it with his/her advisor early in their Delhi career. Disney courses include Communications, Leadership, Hospitality Management, Human Resources Management, Disney Marketing U, and Disney Experiential Learning. It sounds like a good program for the right type of students, but I wonder if they are the target of jokes about their “Mickey Mouse” degree. * ADDED: Thebestcolleges.org doesn’t disclose its ranking method, but their list can be a starting place to find colleges that offer hospitality management major. The College Board is another resource to use for finding and evaluating schools. Andy Orin, “Career Spotlight: What I Do as a Hotel Manager”, Lifehacker, January 20, 2015. Matt Konrad, “Check Into These Hospitality Management Scholarships”, U.S. News, March 20, 2014.